It is the first Saturday in April and I am sitting at my home office desk. As always, I have my laptop positioned so that I can quickly shift my gaze to the ongoing wildlife show outside. There is a view of two bird feeders and two nest boxes, with one of the boxes already having a meticulously crafted cup nest made of long pine needles. I have enjoyed watching the courtship of yet another pair of Eastern bluebirds this spring, as I have done for twenty consecutive springs. Today, my focus shifted to a surprise appearance. As I was scouring the internet in frustration for shorts and skirts that flatter a short, pear-shaped woman, a pattern of movement just outside my window prompted a reflexive upward movement of my gaze. I am not being dramatic. My jaw fell open. 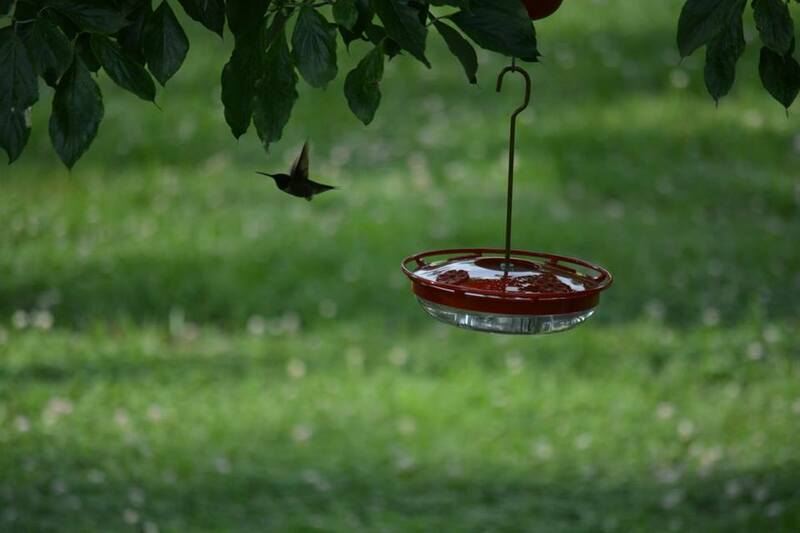 It was a male ruby-throated hummingbird. It seems the males arrive a bit earlier each year. Check out the migration map at hummingbirds.net. He hovered and examined the suet feeder and then faced the window. I realize he was likely looking at his reflection. But if I were to anthropomorphize, I would say he was looking at me in such way as to place an order for the hummingbird feeders to be reestablished post haste. And if that were the case, it is the very least I can do given the daily air shows that hummingbirds provide at no charge all summer, and apparently most of the spring. Hummingbirds are special to me. 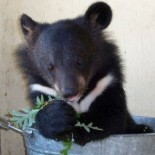 I inherited my interest in them from my father who began feeding them with sugar water when I was in high school. If you knew my father, you would find this information quite surprising. Some of my earliest memories with Pop include watching Mutual of Omaha’s Wild Kingdom, fishing for large mouth bass and long lectures about how animals belong outside. We had goats, pigs and ducks when I was very small. I have a vivid memory, around age four or five, of begging him to free a jack rabbit he had caught in a trap. I have another even more vivid memory at age twenty-seven of insisting that we release a very distressed and croaking catfish that I had caught. Pop’s love for wildlife definitely rubbed off on me. But my passion for understanding more than the utilitarian value of wildlife blossomed where his had stunted. 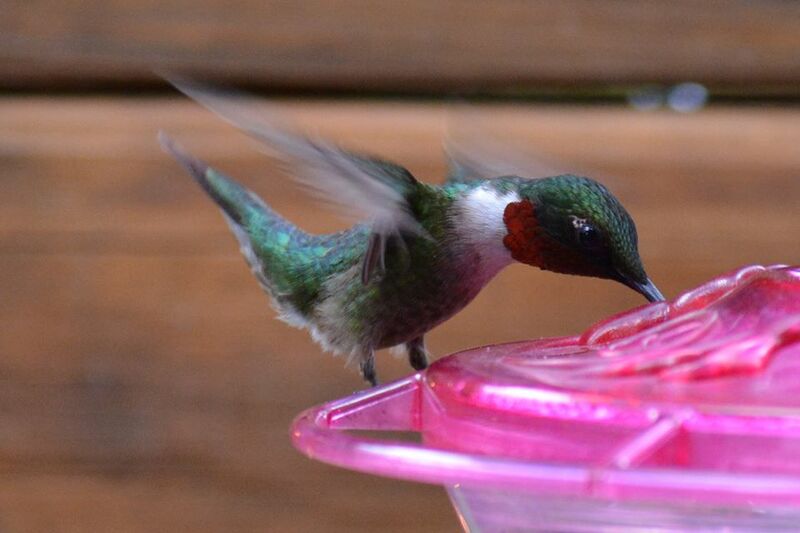 However, his interest in hummingbirds has always been purely benevolent. For this reason, hummingbirds are a symbol to me that anything is possible. Forested areas of eastern North America and across the Canadian prairies. Wintering grounds in Mexico and Central America are tropical forests. The nectar of red or orange tubular flowers. Also mosquitoes, gnats, fruit flies, spiders and small bees. Some scientists believe that as many as nineteen species of plants found in the eastern United States have co-evolved with hummingbirds, based on the relationships between the tubular shape of certain flowers and the length and shape of hummingbird bills. Hummingbirds inadvertently collect pollen on feathers and their bills while feeding on flowers and are as efficient in pollination as honey bees. While the population of Ruby-throated hummingbirds is very stable and estimated at more than seven million, they can be easy targets for cats if feeders are placed too low. The Audubon Society offers comprehensive information and resources, but it is really as simple as providing nectar supplementation by creating a sugar water mixture of one part sugar to four parts water, bring to a boil, cool and refrigerate up to a week before making a new batch. 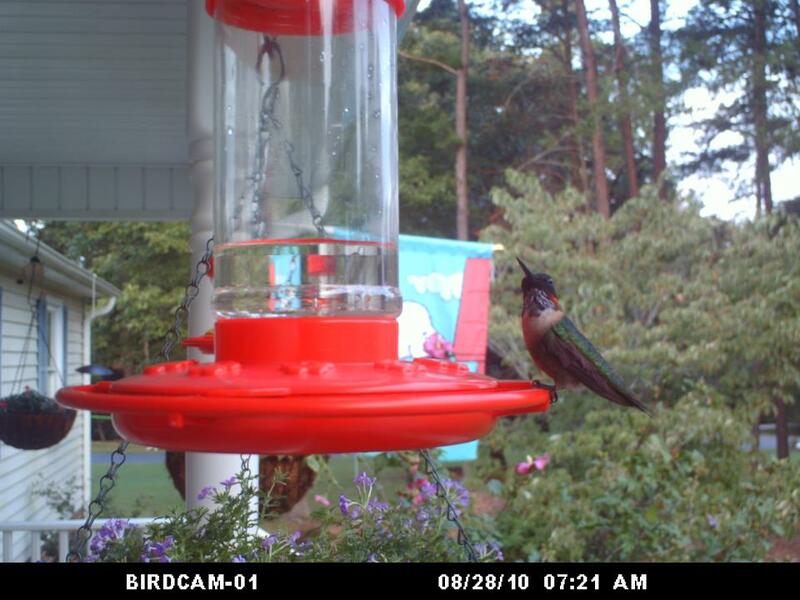 Hummingbird feeders are available in many retail stores and are quite affordable. Just be sure to clean them twice weekly and remove all black mold. Avoid use of bleach. I prefer a diluted white vinegar solution and specialty brushes to get the nooks and crannies properly cleaned. Of course, planting native plants that have red or orange tubular flowers is also a terrific strategy for attracting these little acrobats to your garden. I hope you have time in your busy schedule to watch the PBS full length documentary Hummingbirds-Magic in the Air. If you do, I am certain you too will come to see hummingbirds as a symbol that anything is possible. Just this afternoon I noticed a hummingbird perched on the highest new shoot of an Alder tree that is just beginning to leaf out. He was just a shade darker green than the tree shoots, Then he flew off. I love those guys! My friend has a feeder on her deck, and she has red hair, we laugh each summer because we think they flirt with her (because of her hair). 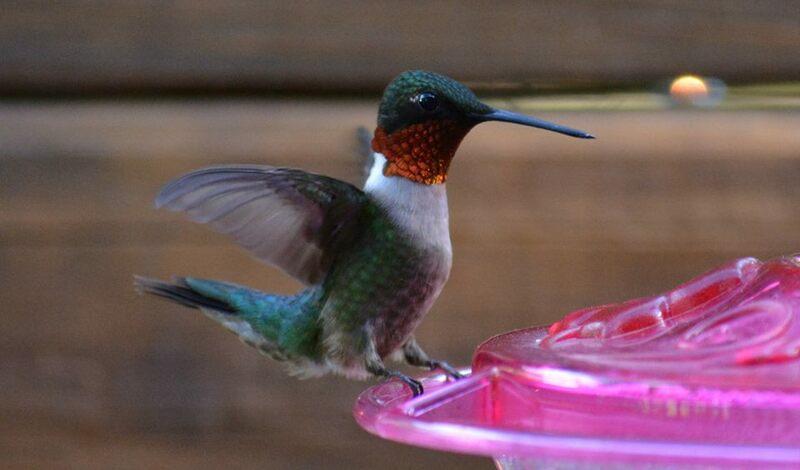 This entry was posted on April 6, 2014 by Maymie Higgins in Birds, Hummingbirds, Maymie Higgins, Pollinators and Seed Dispersers, Wildlife and tagged attracting hummingbirds, bird migration, hummingbird feeders, hummingbird nectar, hummingbirds, ruby-throated hummingbirds, tubular plants.